Nearby - Kirkcolm; Leswalt; Stoneykirk; Sandhead; Ardwell; Port Logan; Drummore; Kirkmaiden; Mull of Galloway. One of the major problems for Portpatrick as a port was its geography. The land access wasn't great. The road gets there down a steep slope, but the railway approached from the south and ended up in a station at a height of 50m and nearly half a mile from the harbour. A steep harbour branch was built suitable only for short trains, but was little used. The Southern Upland Way starts in Portpatrick. Port Logan is the one spot on the west coast of the Rhins where there is a wide expanse of easily accessible sandy beach - there are other bays, but all at the foot of steep paths through the cliffs. As such it is the only settlement of any size on the west coast other than Portpatrick. The Mull of Galloway at the southern tip of The Rhins is as far South as you can get in Scotland - marked by a splendid lighthouse (open to the public) and foghorn. The actual southern tip is Carrickcarlin Point. (This is roughly the same latitude as Workington, Penrith, Bishop Auckland and Hartlepool). Bladnoch Distillery (30 miles) is the nearest distillery. Nearest specialist whisky shops: AD Rattray, Kirkoswald (44 miles); Robbie's Drams, Ayr (58 miles); TB Watson, Dumfries (74 miles). Kirkcolm ("Church of St Columba") is the northern of two small settlements in the North Rhins peninsula, on the west shore of Loch Ryan - opposite Cairnryan. To the north there is little remains of ﻿Corsewall Castle﻿, but the Lighthouse is operational, with the rest of the buildings converted into an hotel. 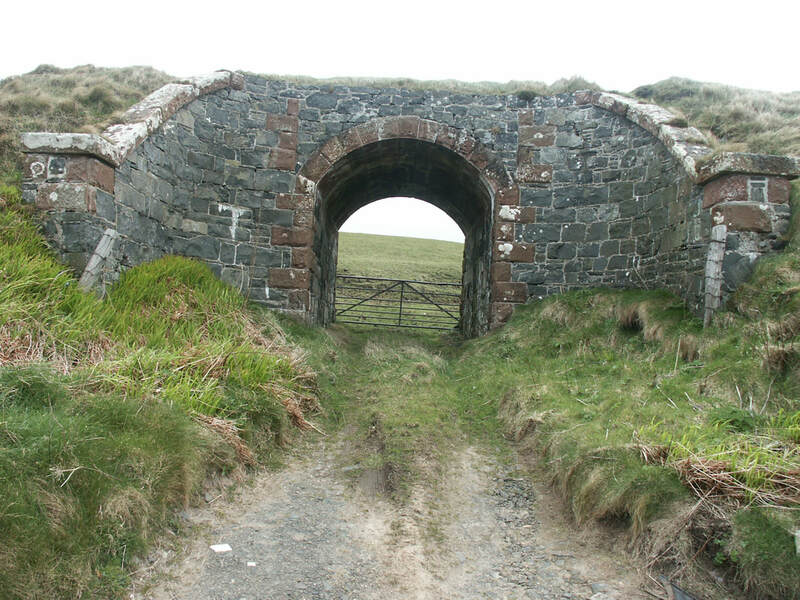 Leswalt (possibly Gaelic "lios uillt" - "garden" or "fort" "of the glen"; or Welsh "llys gwellt" - "grass court") is the other village/parish near Loch Ryan, built around the parish church of 1828, there are ruins nearby of an older church. Lochnaw Castle is a 16th century tower house on the banks of Lochnaw Loch, which has an older ruined castle on an island in the middle - sacked by Archibald the Grim in 1390 - and a number of crannogs. Further west are the ruins of Galdenoch Castle. Stoneykirk was named after its now disused parish church - the parish stretched across the Rhins and down to and including Ardwell, but not Logan. The first kirk seems to have gone through a range of names, but was replaced in 1827. 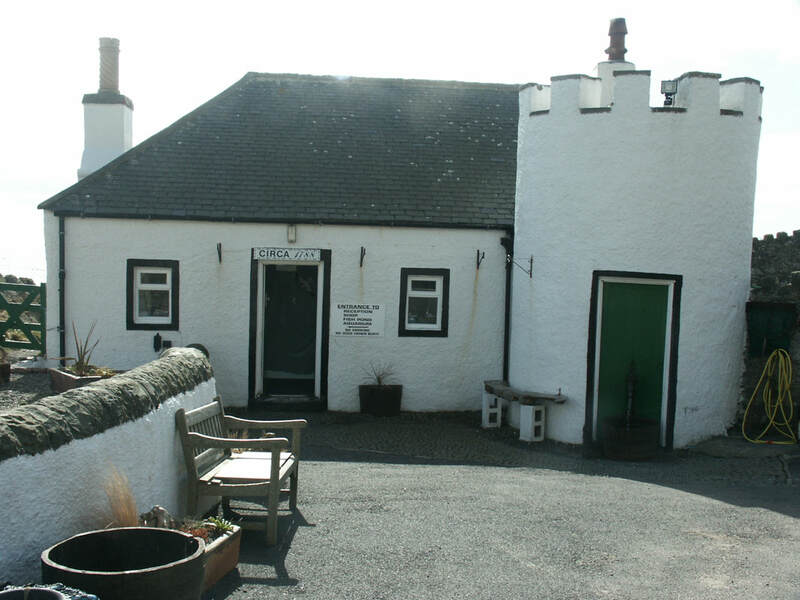 The remote Knockinaam Lodge was the venue for a secret meeting between Churchil and Eisenhower over DD planning in WWII - it is on a west coast bay in a rocky coast line at the end of a long drive. Sandhead, was part of Stoneykirk parish and is where the A716 the main road down the Rhins reaches the east coast. It is at the southern end of Luce Sands, which stretch 7 miles to the mouth of the Water of Luce. It is next to former RAF West Freugh, closed in 2001 and now MOD West Freugh operated by privatised military firm QinetiQ which tests bombs and missiles over parts of Luce Bay and Torrs Warren. South of the village, Kirkmadrine Church has a collection of old monuments dating back as far as the 400s. Ardwell is a small settlement on the Luce Bay coast of the Rhins, but the Ardwell Estate stretches right across to Ardwell Point on the Irish Sea coast, 2.5 miles away and is based at Ardwell House. The remains of Killaser Castle, a tower house, are on the estate. Doon Castle at Ardwell Point is the best preserved Iron Age broch in Galloway. Ardwell Gardens is open to the public. 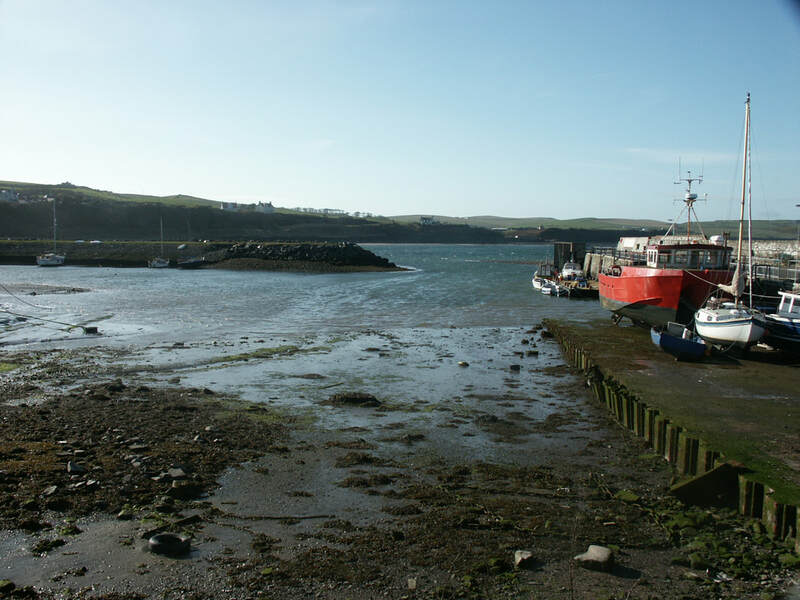 Port Logan (Gaelic "lagan" - "a little hollow") dates to 1682 when the first pier was built at what was then Port Nessock. By 1788 the laird from local Logan had the Logan Fish Pond built at the north of the bay. The current harbour was built by John Rennie in 1820 and a causewayed road was built in front of the existing houses in the village - hence the apparent below road level houses. The plan had been to rival Portpatrick, but this ambition was never realised. The BBC series Two Thousand Acres of Sky was filmed in Port Logan in 2001-03. The hotel has, however, closed down. Logan Botanic Garden is a specialist garden of the Royal Botanic Garden Edinburgh, and is described as the country's 'most exotic garden'. Logan House Gardens were originally part of the Botanic Garden, but is now a separate entity famed for its Monkey Puzzle Avenue, and in spring its vast rhododendron collection. Logan House itself is a three storey pink mansion built in 1702. There is also the ruins of a Tower, but this was gutted by fire in about 1500. 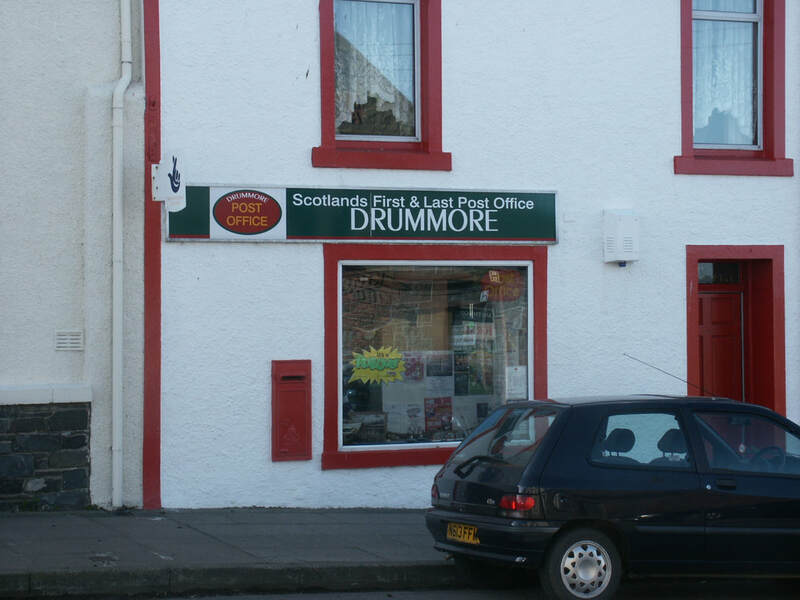 Drummore (Gaelic "drum mor" - "big hill" or "big mound") is the most southerly village in the Rhins and the most southerly Post Office in Scotland, marginally South of the one at Isle of Whithorn. 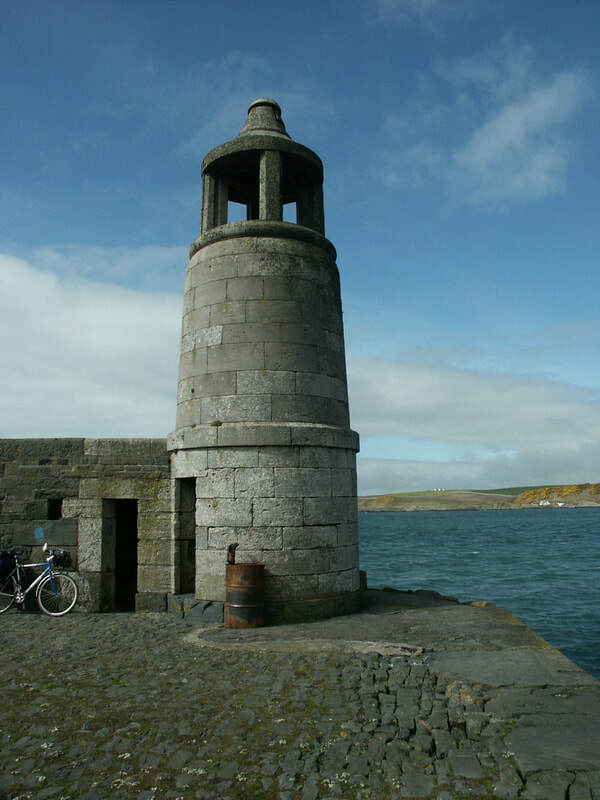 As a whole though Isle of Whithorn is slightly to the south of Drummore. Drummore Harbour was owned by the Ministry of Defence until 2004, but the Trust that took over has had financial difficulties and the Harbour reverted to Crown ownership, the local community is now seeking to buy it. Kirkmaiden (Church of St Medan) is the name of the parish (Scotland's most southerly), and a small village, a mile inland from Drummore, though the ruins of the original Kirkmaiden Church can be found much closer to the Mull of Galloway, close to St Medan's Cave and Chapel and Cairngaan, the most southerly hamlet. The church was moved in 1638 as most parishioners found its location inconvenient. 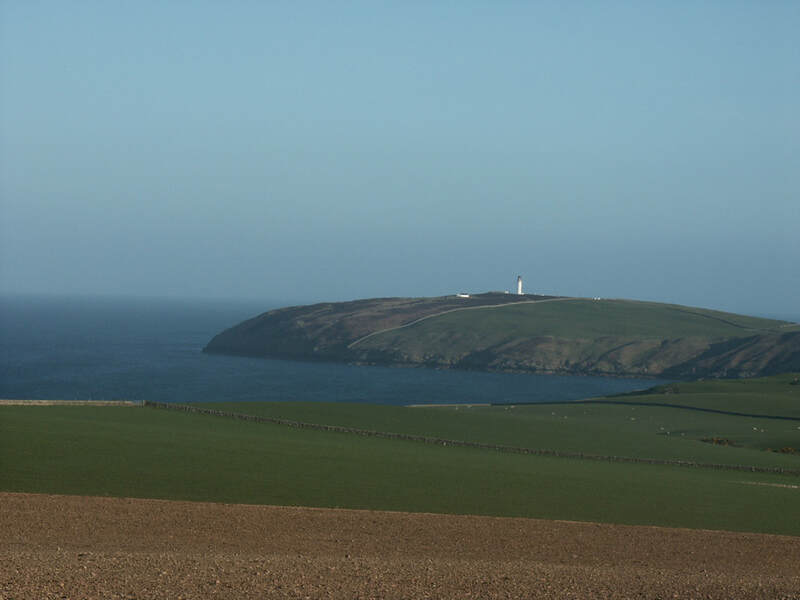 The Mull of Galloway itself is a peninsula at right angles to the rest of The Rhins - nearly cut off from them by the narrow isthmus between East and West Tarbet - and fortifications erected, probably in the Iron Age, between the two to defend the Mull, shown on early OS maps as 'Entrenchments'. The RSPB has a small nature reserve at the Mull. Portpatrick is the most westerly town in the SW of Scotland - and the nearest point to Ireland (other than the more remote Mull of Kintyre) - so a military road was built from the English Border in the 1760s - the railway followed 100 years later, but by then, despite harbour improvements, the westerly winds and the increasing size of ships made Stranraer a better port. 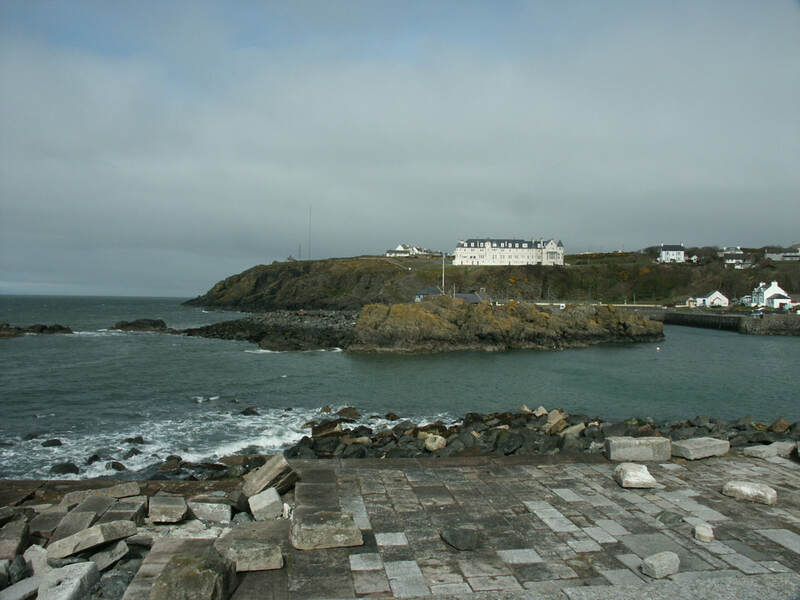 Portpatrick was the initial port for Ireland as it offered the shortest route, but it was vulnerable to the full force of the currents and winds of the North Channel. John Smeaton built breakwaters in 1770 and John Rennie was commissioned to strengthen them in 1821, but this work was not completed. 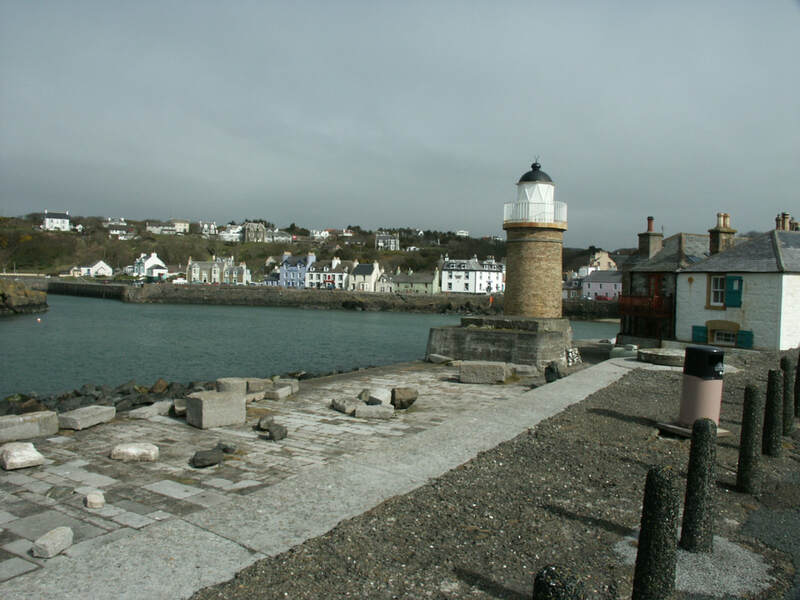 Portpatrick has a small harbour lighthouse, but as part of the expansion scheme of 1821 a larger lighthouse was built to cope with the hoped for greater traffic. When the bubble burst, that lighthouse was no longer needed - and it was dismantled and reconstructed in Sri Lanka. A new lighthouse was built at Killantringan a couple of miles to the north. The roofless ruins of the Old Parish Church (dedicated to St Andrew) are connected to an unusual circular tower, built in 1628. The town is now dominated by the massive Portpatrick Hotel on the cliffs to the north completed in 1907. 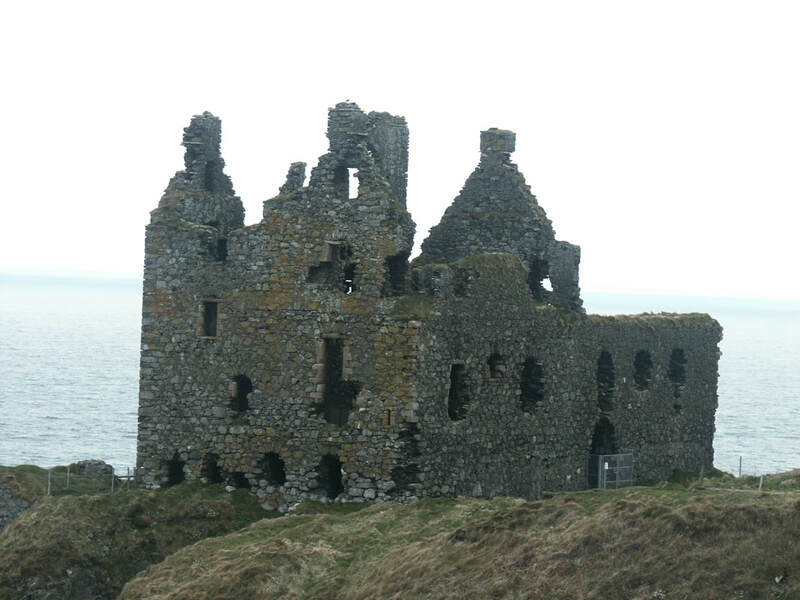 Dunskey Castle is a substantial ruin half a mile south of Portpatrick - the current ruins date back to the early 16th century, but there was a castle on the site, with cliffs on three sides, from many centuries earlier. Stranraer is on National Cycle Route 73. Local cycle routes. Bikes are carried on Stagecoach bus 500 from Dumfries to Stranraer.